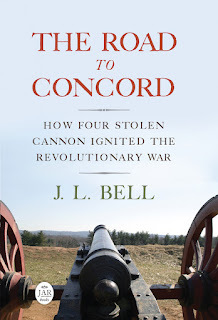 On Thursday, 7 July, I’ll speak on “The Road to Concord: How Massachusetts Moved Toward War in 1774-75” at the Winslow House in Marshfield. There will be a book signing and light refreshments afterwards. Admission is $5 for members of the Historic Winslow House Association, $7 for others. If you’re on the South Shore, please come! 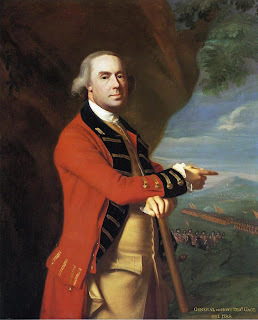 In The Road to Concord, and in my talks about it, I say that after the “Powder Alarm” on 2 Sept 1774, Gen. Thomas Gage’s authority as royal governor of Massachusetts stopped at the gates of Boston. That was of course more than seven months before actual war broke out. In the fall of 1774 Gage held power in Boston and in nearby Castle William. In every other town of the province, people were free to ignore the Massachusetts Government Act, and they did. They kept the courts closed and the Provincial Congress open, and there was almost nothing the governor could do about it. There was one exception to that pattern, however. In 1775 Gen. Gage wrested back some control over Marshfield, a coastal town in Plymouth County. About a week ago, one hundred and fifty of the principal inhabitants of the Town of Marshfield entered into General Ruggles’s Association against the Liberty plan. When this was known at Plymouth, the faction there threatened to come down in a body and make them recant, or drive them off their farms; on this the Marshfield Associators sent an express to General Gage, to acquaint him with their situation and determination, and to beg his support. On 23 January, the governor detached Capt. Nisbet Balfour of the 4th Regiment to support the Marshfield Loyalists. The letter described him as bringing “three Subalterns, and a hundred private men,” plus “three hundred stand of Arms for the use of the gentlemen of Marshfield.” Those companies landed near the mouth of the North River and moved into buildings on Thomas’s estate. Two hundred of the principal inhabitants of this loyal Town, insulted and intimidated by the licentious spirit that unhappily has been prevalent amongst the lower ranks, of people in the Massachusetts Government, having applied to the Governour for a detachment of his Majesty’s Troops to assist in preserving the peace, and to check the insupportable insolence of the disaffected and turbulent, were happily relieved by the appearance of Captain Balfour’s party, consisting of one hundred Soldiers, who were joyfully received by the Loyalists. The King’s Troops are very comfortably accommodated, and preserve the most exact discipline; and now every faithful subject to his King dare freely utter his thoughts, drink his Tea, and kill his Sheep as profusely as he pleases. The Patriot movement was encouraging Americans to make as much wool as possible so as to supply American spinners and weavers and cut down the need for imported cloth. Killing a sheep for meat had therefore become a political act. The town of Marshfield, with part of that of Scituate, having been lately under terrors…from the threats of their neighbours, for having formed some associations amongst themselves, applied to me for protection; and I have sent a detachment of one hundred men to their relief. It is the first instance of an application to government for assistance, which the faction has ever tried to persuade the people they would never obtain, but be left to themselves. TOMORROW: Protests from the neighboring towns.